I LOVED this book! Jen Glantz could totally be my new best friend. And, I'm sure that's how the brides who have hired her to act in that capacity feel as well. Always Bridesmaid (For Hire) reads like a romantic comedy, but it's a memoir. The true story of what happens when a single woman gets asked one too many times to sashay down the aisle in uncomfortable shoes and smile while another one of her friends pledges her life to her betrothed. The result? Said girl goes on Craigslist and creates a tongue-in-cheek ad offering her services as a professional bridesmaid. Then, goes to bed and wakes up to find her ad has gone viral and she's got a new career. By the way, this book contains a nifty list of things to do with a bridesmaid dress. 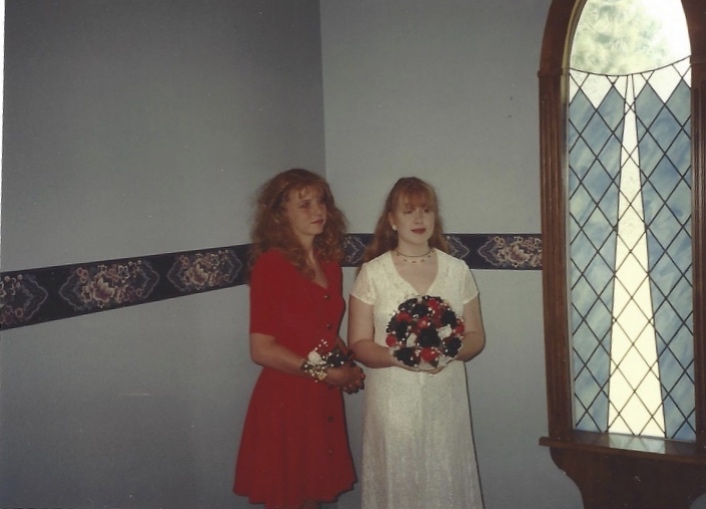 My high school best friend's wedding. Circa 1994. She's now an awesome stand-up comic in OKC. This was my favorite dress because it was mine. She told me I could wear whatever I wanted. And it was the 90s, so yes, I have lots and lot of hair. Always a Bridesmaid (For Hire) captures that time with hilarious accuracy. Glantz's conversational style feels like she's telling you stories over margaritas rather than writing her life story. And, at its heart, this book really isn't truly about being a bridesmaid, even though the stories she includes on that and her experiences with online dating had me laughing so hard that my dog woke up from her nap to check on me. This book is really about love, friendship and losing yourself while trying to take care of everyone else. My college friend's wedding. August 1997. I should have run when she put her arm around me and asked, "Do you love me enough to wear pink?" But, I did love her and I was sort of dating one of the groomsmen so bring on the pastels! The groomsman turned out to be a jerk face and I hear he's bald now. Just wanted to throw that in. Glantz takes you through her journey of discovering why someone would hire a professional bridesmaid, how she turned it into a career and how that led to her crying in an airport bathroom. All without asking for sympathy or pity. And, all with a terrific sense of humor. College roommate #1's wedding. This dress was supposed to be champagne-colored, which, incidentally, is the exact hue of my skin tone. It also had this open-back-tie thing going on. The tie had to be safety pinned to my bra because I performed a song in American Sign Language and every time I moved, I gave the preacher a peek at my unmentionables. The second picture was taken after I scooped the flower girl up to carry her out of the church at the end of the service because she was just done and refused to take another step. I am a problem-solving, fix-it type person. I think that's why I could identify with Glantz's desire to be sure the brides she works for get the best day possible without having to sweat the little things. Her website Bridesmaidforhire.com offers great advice for anyone faced with, I mean, honored with this privilege. College roommate #2's wedding. At least by this point, I had a cute date. Sister-in-law's wedding. Sometime in 1999. By then, I'd decided I liked my date so much that I should probably keep him.